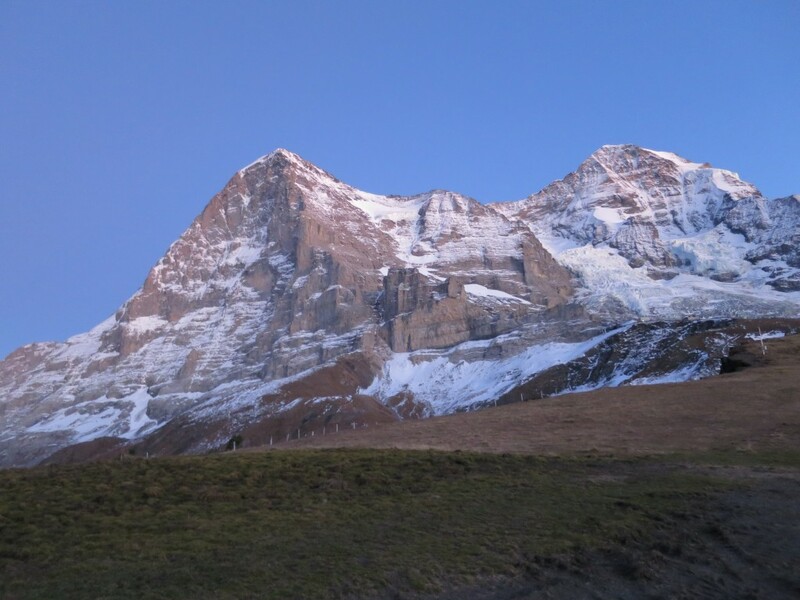 Eigerwand and Mönch`s N face. 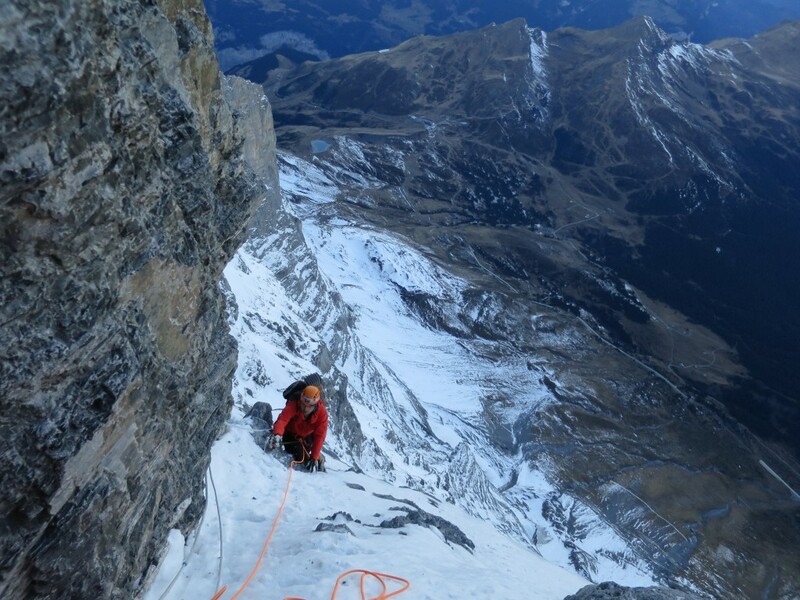 It´s a rare thing to meet a climber who wouldn´t have dreamed about climbing the biggest north face in the Alps. During the last 80 years Eigerwand has played a big role in the deveploment of climbing, as the climbing worlds leading names have pushed the bounderies further. 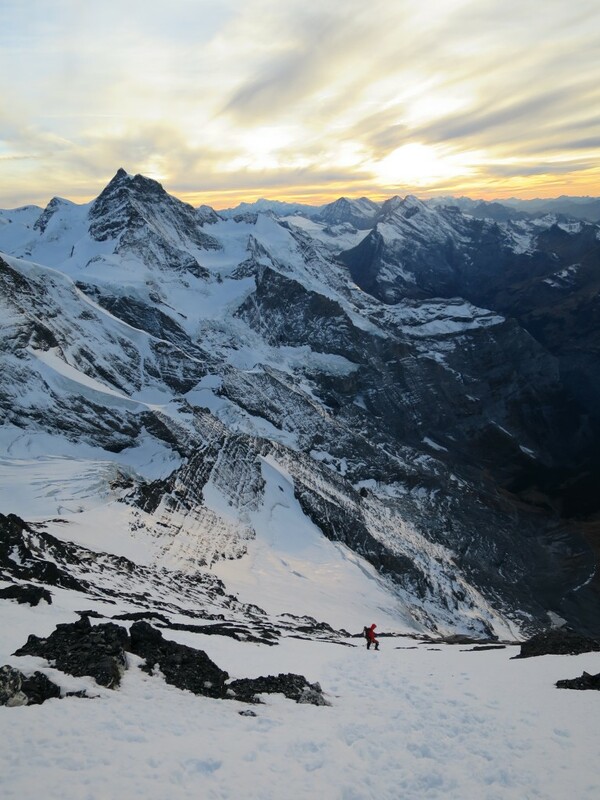 The first ascent in 1938, Ueli Steck`s speed records, Harlin directtissima, Dean Potter´s free base climbs and Jeff Lowe`s Metanoia to name a few remarkable achievements on the face. 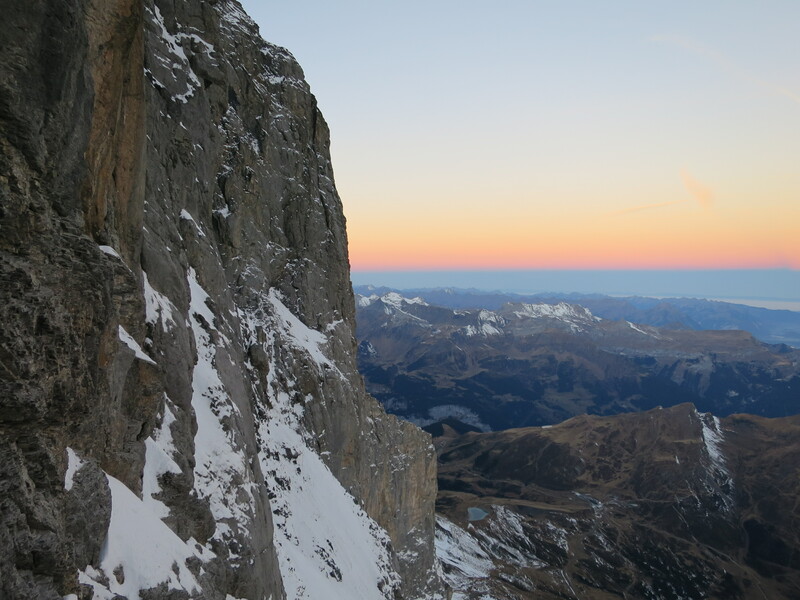 Is there any other alpine face in the world with a such a rich history? It was first weekend of November when the news from the excellent conditions of the north face hit the internet. Instantly I started to search a partner for the next week as forecast promised a long lasting high pressure to Bernese Oberland. Kalle Vuorenmaa deciced to skip less important school work and come along. 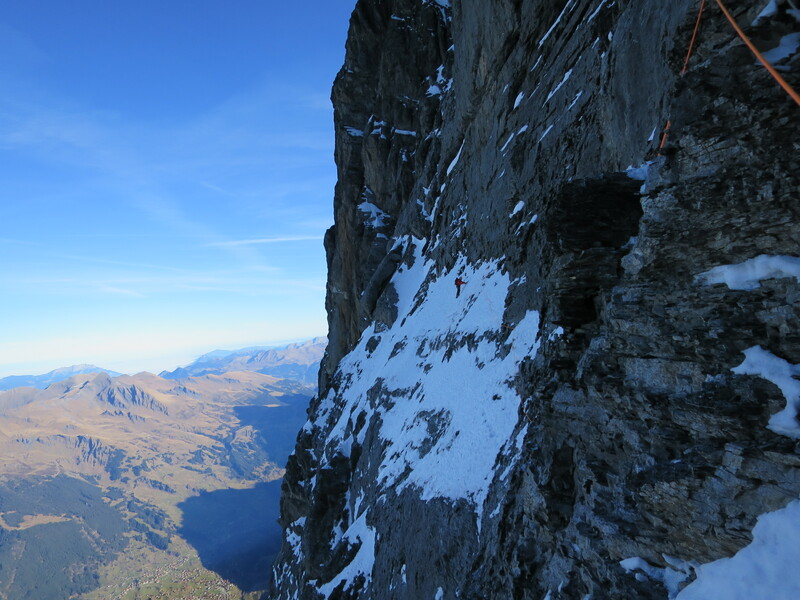 We booked flights to Zurich on Sunday and already bivied at the Eigerglectcher station on Wednesday. 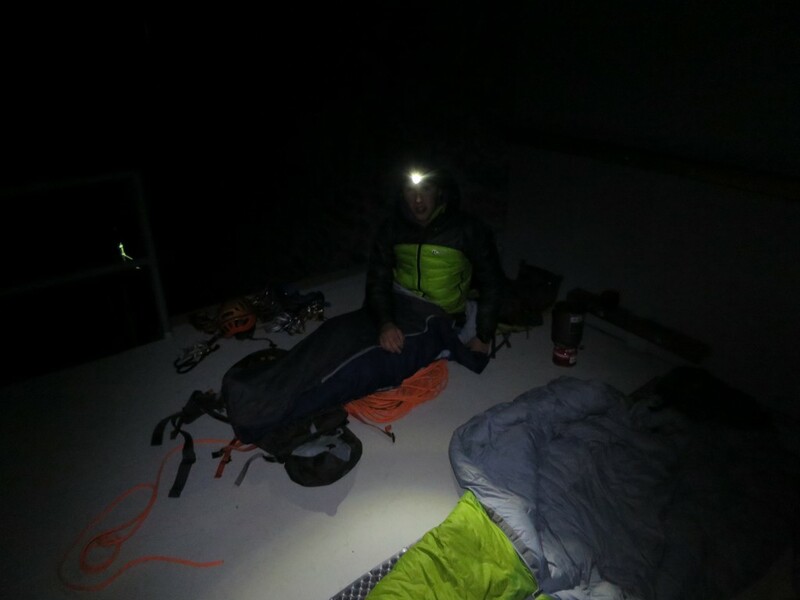 It was hard to gain any sleep due to angry fox, which disturbed by trying to steal my packpack couple of times. Before midnight we were on our way to the route. A bit too early start, but we wanted to get down in a daylight. We soloed first couple hundred meters to the Difficult crack, which is the first real obstacle on the route. Unsecure nature of climbing became familiar. Sloppy holds and slipery limestone was far from the Finnish granite. I led the steep crack without too much fuss. Except the Difficult crack was now front of me. We had climbed some kind of a direct variation without the last traverse from the left. More easier terrain under the Rote Fluh appeared and we began a long simul climb section which ended to the Death bivouac. 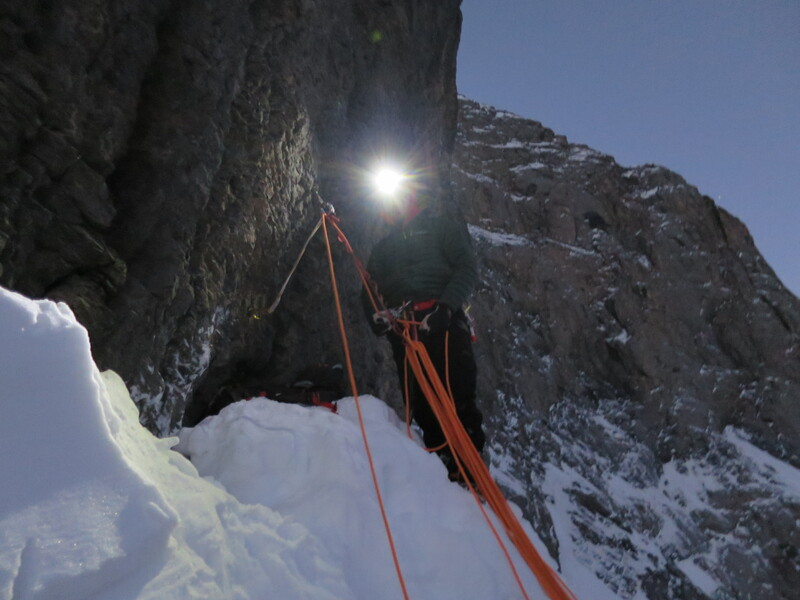 Of course we swapped leads twice when draws run out, but didn´t belay any of the climbing in pitches. Hinterstoiser traverse, Ice Hose and Flat Iron were all iced up and all floated by. Kalle belaying at the Death bivouac. Sunrise over the Swiss foothills. 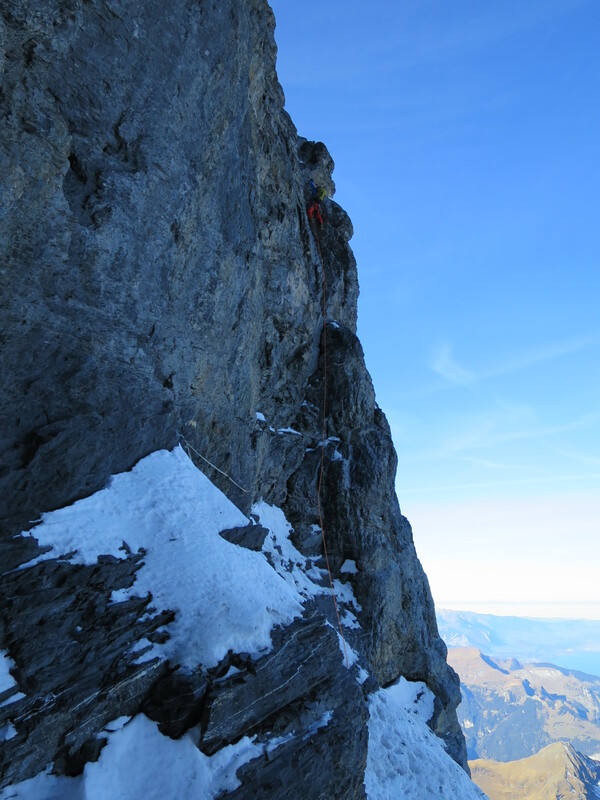 We melted some snow at the Death bivouac when pair of Swiss climbers passed. They were the only people on the route we saw, but later on we find out that the route was full of climbers. At sunrise we continued the climb through the Ramp. 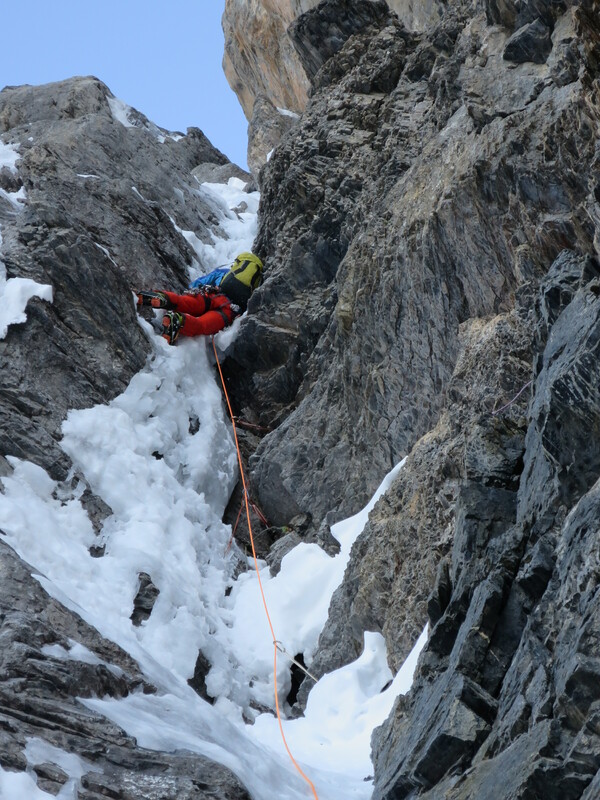 The most entertaining pitch was the Waterfall chimney, which warm temperatures and other climbers had made a hollow and technical ice climb. Overhanging bulge needed careful climbing and went probably around WI5+. How did they climb that in 1938? Juho doing tricks in the Waterfall chimney. More historical sections followed. Brittle ledges were definately brittle and the Brittle crack supposed to be the crux. It was full of in-situ gear though. Bring enough draws and you´ll be able to belay most of the route with them. Traverse of the Gods is one of the most legendary pitches anywhere and you can really feel the Eigerwand´s exposure on the last meters of it. We moved together all to way to Quartz crack sprinting up the White Spider as fast we could. And I can tell you our pace wasn´t very fast anymore. I balanced up a polished slab which was the real technical crux of the route. Juho climbing the Brittle crack. Kalle and the Traverse of the Gods. Kalle following the Quartz crack. Exit cracks offered full-on chimney stemming without pro on the first 15 meters, but eased up quickly. 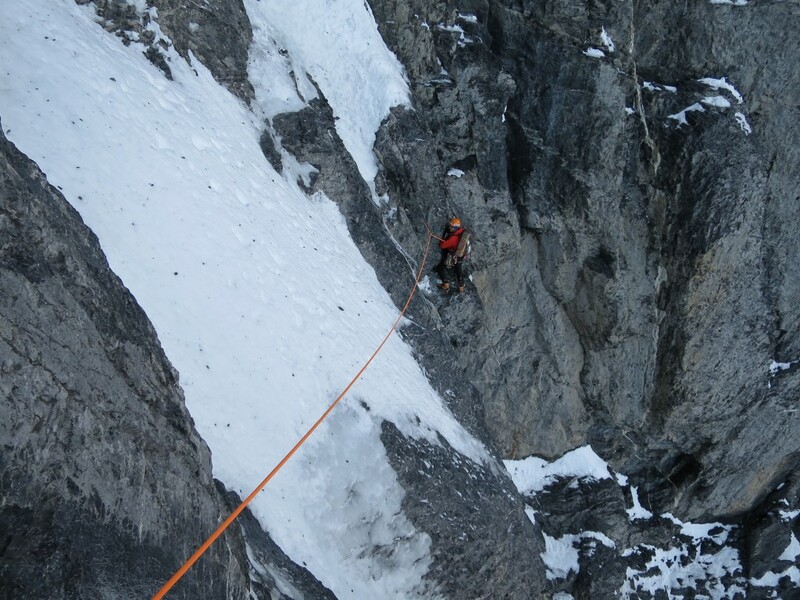 We took the rope off and climbed the remaining snow field and Mitellegi ridge to the summit. It was a beautiful, but windy late-afernoon. I had just completed the north face trilogy, but didn´t feel anything special. Just a bit tiredness in my legs. This was also Kalle`s third route in the Alps, and I have to say, his alpine ticklist is pretty impressive in Finnish scale. West face descent should be a easy two hour plod, but in the dark, climbing down short ice steps felt very odd. Zero sleep in the previos night didn´t help route finding skils and eventually we decided to bivy only 200 vertical meters from the train station. And yes, we must return to improve our time! West face descent in a shading light!